There are so many wonderful things I enjoy this time of year and one is Christmas movies. Already, my mom and I have been looking up movies on the Hallmark Channel, Lifetime, and Netflix to see which ones we would like to see. And making plans to get together to watch some of our old favorites. My list of must see movies has grown over the years, though growing up I never remember having a list. However sometime in my early twenties I began to notice that every year I made sure I watched White Christmas. I don't really know why it's one of my favorites, but there are many reasons why it could be- Bing Crosby for one. His deep melodious voice is just wonderful. 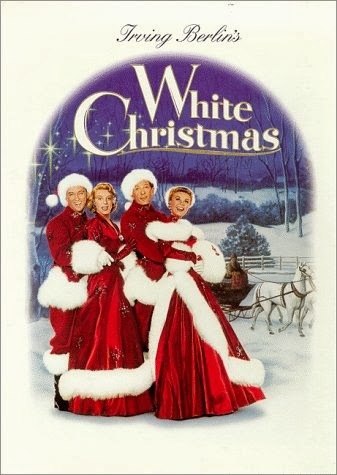 The version of the song "White Christmas" from this movie is my absolute favorite. The setting is beautiful, as well as the costumes and dresses. The World War II scene and military hero reunion makes me think of my grandfather who served during that time. And the "Sisters" and "Snow" songs are ones I used to sing with my cousins and sister. So I guess it being one of my favorites is partly to do with the familial ties to this movie as well as the music and of course the Christmas romance. In addition to White Christmas, I discovered The Christmas Card about six years ago. It is such a delightful movie about a woman who sent a Christmas card to soldiers with her church and the soldier who got her card and felt so drawn to the quaint town and people she described that he travels there. Hmmm, that sounds a bit stalker-ish, but it really isn't. It has romance of course, but also humor and my favorite character may be Uncle Richard who makes it no secret what he thinks. What are some of your "must see" movies for Christmas?